The bizarre sport of bathtubbing, enjoyed by TV stars Rory McGrath and Will Mellor, comes to North Wales next month, with the World Championships. 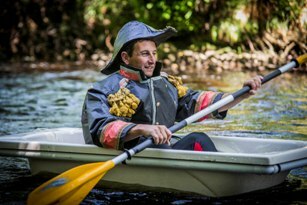 The All Wales Boat Show is following in the footsteps of Christchurch in New Zealand in hosting a round of the quirky contest. 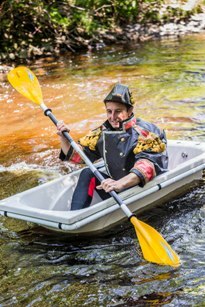 Entrants are expected from around the world for the competition – described as kayaking in a bath. Three days of practice runs will allow entrants get their sea-legs, with the contest itself on Saturday July 27. It’s one of the many attractions at the All Wales Boat Show, which runs from July 24-28. Split between Conwy and Deganwy Quay marinas, the event will see visitors ferried across the River Conwy from one harbour side to the other. There will be a range of craft on show, plus the chance to try out some of the equipment on sale, along with a variety of events and entertainment. Water sports enthusiast and instructor Tony Bain, who runs Green Dragon Activities in Llanwrtyd Wells in Mid Wales, came up with the madcap idea to complement the off-beat events held regularly in the Cambrian Mountains town, such as the annual bog-snorkelling and man versus horse contests. 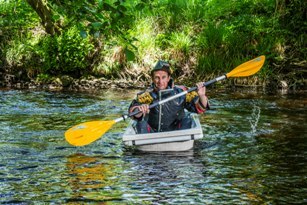 The New Zealander’s company also offers Akwakats – kayaks powered by bikes on rivers and canals – along with mud wrestling and paddling in wheelie bins. In the last series of BBC’s Great British Menu, renowned Welsh chef Mary Ann Gilchrist was seen taking part before trying out some of her recipes on fellow paddlers. Tony is also encouraging entrants to raise funds for their favourite charity through sponsorship. Enter by e-mailing greendragonactivities@gmail.com. The next rounds in the contests are being held later this year in Cardiff and the Cotswolds.